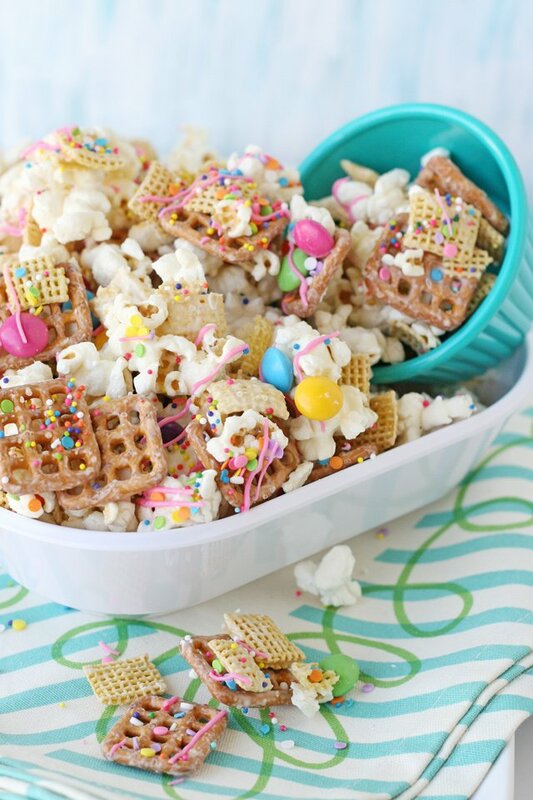 Sweet, salty, crunchy and delicious… this Party Popcorn Snack mix is simply perfect! 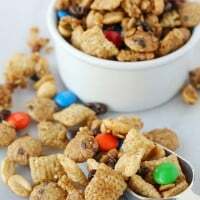 This recipe has been my go-to party snack mix for years and EVERYONE loves it! 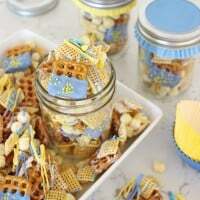 This pretty snack mix is super easy to make and I’ll tell you from experience…. this stuff is addicting! 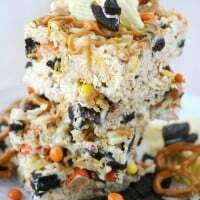 One of my favorite things about this sweet and crunchy mix is that it can be adjusted to match any holiday or party theme. 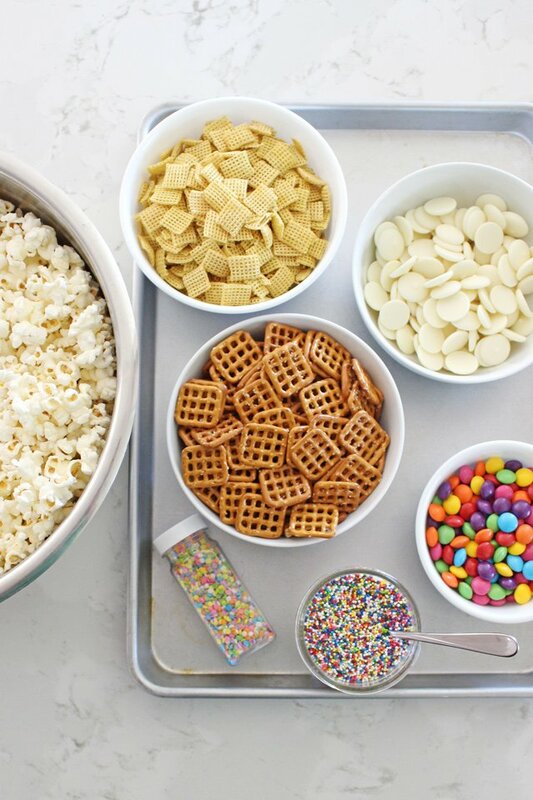 Mix and match with sprinkles and candies of your choice to create a custom snack mix! 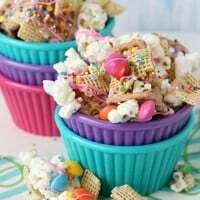 For this particular mix I included popcorn, corn chex, square mini pretzels, M&M look-a-likes from Party City (because I love the colors), and plenty of cute sprinkles! I used Ghirardelli brand white melting chocolate disks for the coating. Of course feel free to mix and match ingredients to your heart’s desire… I’m just sharing what I used. 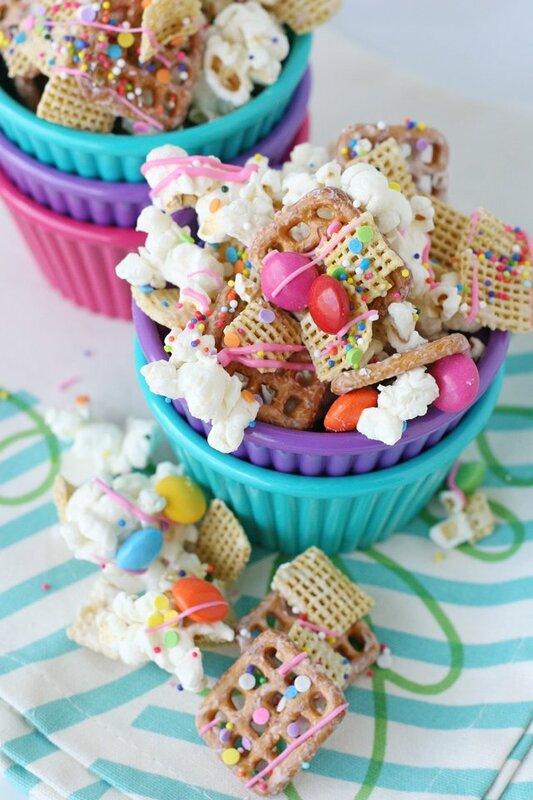 Mix and match your favorite sweet and crunchy snacks to create a delicious mix! In a large roasting pan, or very large bowl, mix all ingredients except the M&M's, sprinkles, and candy melts. Do not over fill your dish, you will need room to toss the ingredients together. You may need to make the mix in two batches (if you don't have a large enough bowl). Melt white chocolate (or candy melts) in a microwave safe dish (at 50% power) in 30 second intervals until almost melted. Stir until completely melted and smooth. Use a spoon to drizzle the melted chocolate over the dish of snacks. Mix as needed to coat. It's up to you if you want the mix to be totally coated, or lightly coated (depending on the amount of melted chocolate you use). Stir to combine. Spread the snack mixture out onto a baking sheet (or two if needed). 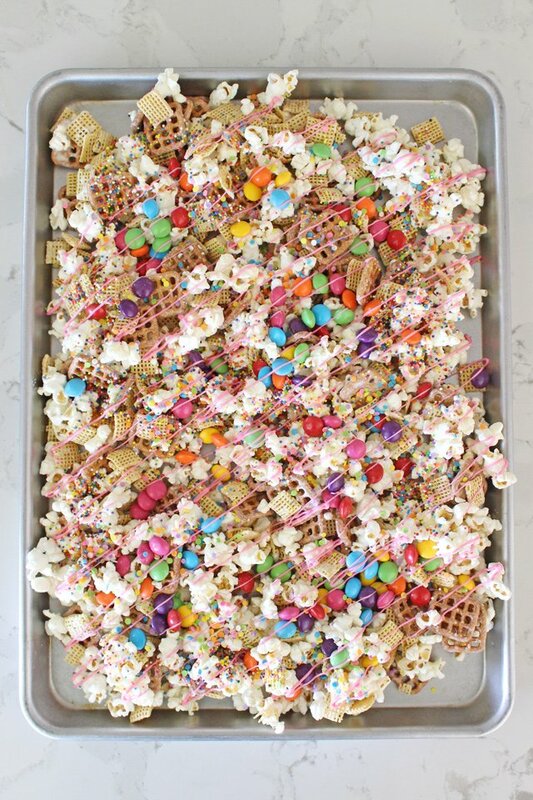 While the white chocolate (or candy melts) are still melty, sprinkle M&M candies and sprinkles on top of snack mix. If desired, melt colored candy melts (in the microwave at 50% power in 30 second intervals or less). This can be done in a thick plastic piping bag or thick ziplock type bag. Snip off one corner of bag and drizzle over the snack mix. Allow the chocolate to set before packaging up the mixture (about 30 minutes). Break into small clusters, as desired. Please note, the ingredient measurements listed are what I generally use, but feel free to adjust according to what you have, and what you like. For the mix shown I used popcorn, corn chex cereal, square pretzels, sprinkles and chocolate candies (M&M look-a-like) from Party City. The mix is best when enjoyed within 1-2 days. Store in ziplock bags or a sealed tupperware type container. 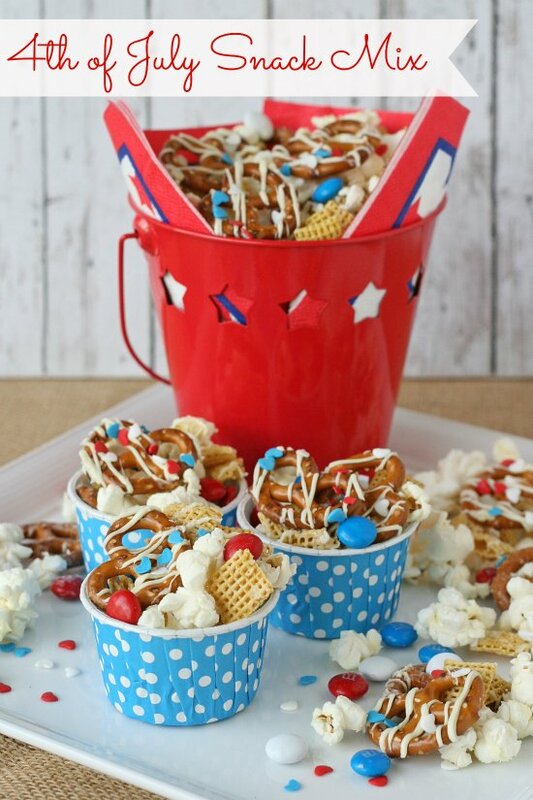 Here’s a holiday-ready version of this snack mix I’ve shared in the past that’s perfect for 4th of July! 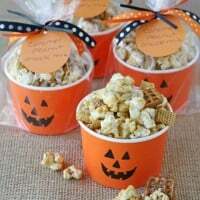 I love making a big batch of this Party Popcorn Snack Mix for birthdays, holidays or a special treat anytime! What I wouldn’t give for a snack like this right now while vegging in front of the TV! Yummmmm! It is seem look nice. Where oh where did you get those adorable bowls??? I need those in my life! Believe it or not, they’re from Wal-Mart! They were sold near kitchen utensils (serving utensils, mixing bowls, etc) as mini prep bowls. They’re plastic/melamine. Hope you can find them in your local store. Happy shopping! Curious where I could get the brightly colored ramekens? Love this! Yes, the little ramekins are from Wal-Mart! I found them in an isle with kitchen utensils. They’re plastic/melamine and they’re just so cute! how many portions can you make with this recept? I followed this recipe as told and it came out great!! It ends up with a lot of servings. I had a kid’s party and still had a few containers left. Thanks for posting! !